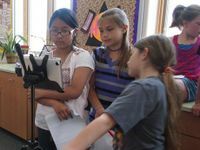 One good thing about this easy-to-use technology is that students can still use important English language arts skills like writing a narrative, planning a sequential story, and including key details when getting ready to make a movie. These apps can enhance the work that you are doing with children in the classroom and give them room to be creative storytellers. Have you tried using mobile devices to make movies? How could you see yourself using these tools in the classroom?